Part of me doubts that these Jihadis are tuning into FOX News from their living rooms in Mosul, but that’s just a hunch. For a terrorist group hell-bent on conquering Rome and establishing a new Caliphate… this seems like a bold strategy, let’s see if it pays off for him. 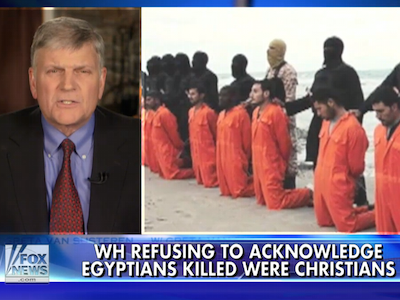 The reverend then went on to attack the White House for its refusal to label ISIS as Islamic, or the Egyptians beheaded by their captors as Christian. Watch clip via FOX News.